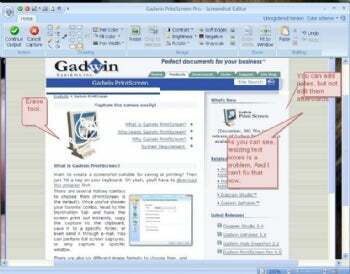 Gadwin PrintScreen Pro: Worth the Price? Not long ago I reviewed Gadwin PrintScreen, a useful little freebie that adds welcome features to your print screen key. I was looking forward to its $25 sibling, Gadwin PrintScreen Pro, which adds image editing functions. I was disappointed. When you make a screen capture--either by hitting PrtSc or pressing a hotkey combo, as in the free version--the image pops up in the Screenshot Editor. You then choose from five option sets: Action, Drawing, Image, Zoom, and Editing. Action lets you Continue Output or Cancel Capture. Clicking Continue Output, by default, appears to do nothing: The program is set to save screen captures to a file, but you won't discover that unless you look in the Preferences menu. Unfortunately, the Preferences icon is not available when Screenshot Editor is open, so you need to select your output destination (print the image, save it to a file, and so on) before you initiate a screen capture. The Drawing options include a text tool that lets you type text onto the image--but only at the top, dead center. You can't reposition the text. You can add a memo with one of the balloon tools, but since you can't effectively resize the text boxes it's difficult to get your full notes to appear--mine kept getting cut off. There's no way to reposition the notes or edit the text afterward. You can use an Image filter to change the contrast or add soft borders, but anything you do affects the entire image; there's no way to select a specific area. The Crop to Selection tool is grayed out in this trial version, so I couldn't test that feature. Both the Zoom and the Editing options are unsatisfactory. Zoom offers you two choices: fit to window and 100 percent. You can't actually zoom in to see image details. The Editing tools are limited to Undo and Redo in the trial version; I couldn't test the Paste option. In short, it's hard to see why one would pay for Gadwin PrintScreen Pro. I found the image editing functions frustrating to use and inadequate.